Objective: This study presents the dosimetric data taken with radiochromic EBT3 film with brass mesh bolus using solid water and semi-breast phantoms, and its clinical implementation to analyze the surface dose estimates to the chest wall in postmastectomy radiotherapy (PMRT) patients. Materials and Methods: Water-equivalent thickness of brass bolus was estimated with solid water phantom under 6 megavoltage photon beam. Following measurements with film were taken with no bolus, 1, 2, and 3 layers of brass bolus: (a) surface doses on solid water phantom with normal incidence and on curved surface of a locally fabricated cylindrical semi-breast phantom for tangential field irradiation, (b) depth doses (in solid phantom), and (c) surface dose measurements around the scar area in six patients undergoing PMRT with prescribed dose of 50 Gy in 25 fractions. Results: Water-equivalent thickness (per layer) of brass bolus 2.09 ± 0.13 mm was calculated. Surface dose measured by film under the bolus with solid water phantom increased from 25.2% ±0.9% without bolus to 62.5% ± 3.1%, 80.1% ± 1.5%, and 104.4% ± 1.7% with 1, 2, and 3 layers of bolus, respectively. Corresponding observations with semi-breast phantom were 32.6% ± 5.3% without bolus to 96.7% ± 9.1%, 107.3% ± 9.0%, and 110.2% ± 8.7%, respectively. A film measurement shows that the dose at depths of 3, 5, and 10 cm is nearly same with or without brass bolus and the percentage difference is <1.5% at these depths. Mean surface doses from 6 patients treated with brass bolus ranged from 79.5% to 84.9%. The bolus application was discontinued between 18th and 23rd fractions on the development of Grade 2 skin toxicity for different patients. The total skin dose to chest wall for a patient was 3699 cGy from overall treatment with and without bolus. Conclusions: Brass mesh bolus does not significantly change dose at depths, and the surface dose is increased. This may be used as a substitute for tissue-equivalent bolus to improve surface conformity in PMRT. Radiation therapy (RT) is an important treatment modality for the management of carcinoma of the breast. Studies highlight the incidence of local recurrence to 5%–10% at 10 years in “high locoregional risk” group of patients., Postmastectomy radiotherapy (PMRT) is delivered to the chest wall and nodal sites. The surgical scar and skin surface of chest wall should receive adequate cancericidal radiation dose to eliminate the seeding of malignant cells during PMRT. In megavoltage (MV) photon beam treatments with modern linear accelerators, the depth of maximum dose (dmax) occurs at a particular depth due to the “buildup” property and this happens at 1.5 cm for 6 MV photon beam. Therefore, surface/skin dose is substantially lower due to this skin-sparing effect. For glancing tangential fields, the resultant skin dose is about 80% of prescription dose in PMRT. Tissue-equivalent bolus (TEB) with low atomic number materials (Wax, Vaseline®, Superflab™ Gel) with a thickness of 2, 5, and 10 mm is routinely employed during PMRT to enhance dose to the chest wall surface/subcutaneous tissue to 95%., This eventually decreases the chance of local recurrence and more than 90% institutions use it.,,,,, Due to variation in thickness, inflexibility/rigidity, and treatment surface irregularity, air gaps often occur between TEB and the skin, resulting in inadequate radiation dose to the chest wall. Medium atomic number brass mesh bolus, e.g., (Zeff = 29.3; 70% Cu, 30% Zn) is found advantageous to overcome these problems to provide better skin dose conformity to the chest wall in PMRT treatments., For 6 MV photons, the dosimetric effects on buildup, surface, and depth doses with brass mesh bolus have been investigated in phantoms and recently reported. Attempts to estimate skin doses with different types of detectors revealed the efficacy of EBT2 type radiochromic film in breast cancer treatments. In 2011, a new generation of GafChromic EBT3 film (International Specialty Products, NJ, US) with superior dosimetric accuracy than EBT2 was introduced., Clinical studies suggest that the skin toxicity till Grade 2 as per the National Cancer Institute Scores (NCIS) criteria serves as a surrogate marker for adequate dose response with bolus, and it is customary to discontinue the application of bolus once the Grade 2 skin toxicity manifests in the patient., In the above context, assessment of surface dose during PMRT treatments using TEB, to avoid severe skin toxicity and to validate the dose of radiation delivered to the chest wall will provide valuable information to the treating clinician. In our hospital, to introduce brass mesh bolus for PMRT treatments, there is a need to characterize the dosimetric data in tangential breast radiotherapy, and detailed studies related to its implementation are reported. An “Elekta Compact” (Elekta AB, Stockholm, Sweden), linear accelerator (linac) with 6 MV photon mode, beam quality index (tissue phantom ratio20/10) of 0.667 in water is used. This has motorized physical wedge (60°), 40 pairs multileaf collimator (MLCi2) with the leaf thickness of 1 cm at 100 cm isocenter, at 350 MU/min and is calibrated to the output of 1 cGy/MU at isocenter as per Technical Report Series (TRS)-398 protocol. GafChromic (EBT3) films, size 4 cm × 4 cm as cut pieces from a single sheet, were irradiated at 10 cm depth, in a 20 cm thick water-equivalent slab phantom (P = 1.045 g/cm3, SP34, IBA Dosimetry GmbH, Germany). Each slab is having 1.0 cm thickness with dimensions of 30 cm (width) ×30 cm (length). During irradiation, source to phantom surface distance 90 cm, with a field size 10 cm × 10 cm, was maintained. Films were exposed to the doses of 0.1, 0.3, 0.5, 1.0, 1.5, 2.0, 2.5, 3.0, 4.0, 5.0, and 6.0 Gy. A calibrated farmer-type ionization chamber (IC) model FC65 (IBA Dosimetry GmbH, Schwarzenbruck, Germany) was placed in slab phantom in a separate setup similar to that of film irradiation one and kept adjacent it, to find dose delivered to the film. Unexposed film was taken as control. The irradiation setup geometry of film and IC in SP34 slab phantom under linac is shown in [Figure 1]. Films were scanned after 3 h of irradiation and digitized with Epson 11000XL (Epson America Inc., Long Beach, CA, USA). RGB-positive images, at 16 bits per color channel with resolution of 72 dpi, corresponding to a pixel size of 0.35 mm2 were saved in Tagged Image File format. Image analysis was done using the software ImageJ v1.42q (National Institute of Health, Bethesda, MA, USA) and MS Excel software. The mean pixel value was obtained from a region of interest, 2 cm × 2 cm centered for the red channel. 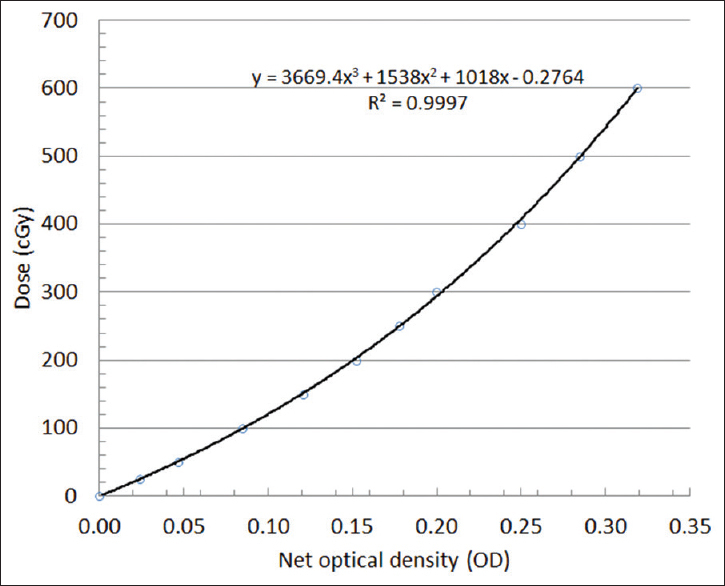 The net optical density (OD) was expressed against control film as logarithmic value of ratio of mean pixel value unexposed versus exposed film. The calibration curve with third-order polynomial, interpolating radiation dose against net OD is shown in [Figure 2]. Commercially available brass mesh bolus (Whiting and Davis, Attleboro Falls, MA) in the form a mesh (P ∼ 8.5 g/cm3) of 45 cm × 45 cm size with the thickness of 1.2 mm was used for patients as bolus. The photograph of brass mesh bolus with 50-mm length section is shown in [Figure 3]. Experiments with multiple layers of this material were performed by folding it several times over itself. Slab water phantom of 12.0 cm thickness having IC at 2.0 cm depth with source to chamber center distance of 100 cm was taken for measurement of water-equivalent thickness of brass mesh bolus. Chamber readings (in nanocoulombs) were collected for 200 MU delivery, for field size 10 cm × 10 cm, by additionally placing slabs of thickness 0.5, 1.0, 1.5, 2.0, 2.5, and 3.0 cm on the top of solid water phantom and also by keeping 1, 2, 3, 6, and 9 layers of brass mesh bolus on the top of phantom. 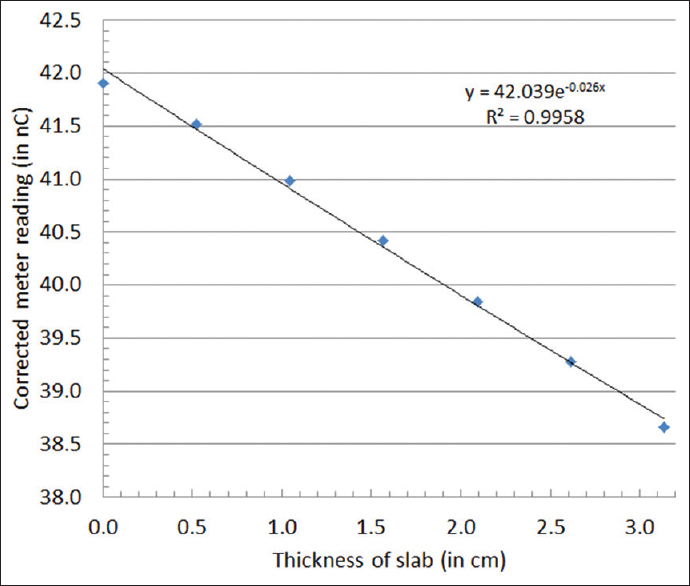 A graph was generated taking the thickness of water-equivalent slabs (which are placed additionally) along X-axis versus corrected charge reading along Y-axis using MS Excel software. An exponential attenuation curve is drawn with the display of equation and regression value which is shown in [Figure 4]. Water-equivalent thickness of brass mesh bolus per layer was calculated by taking the broad-beam attenuation coefficient obtained from the above equation and charge collected with different layers of brass mesh bolus. 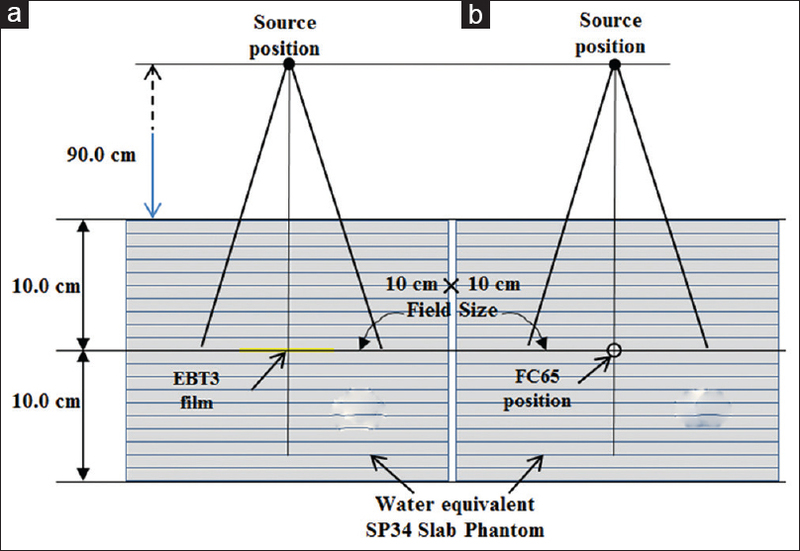 Percentage depth dose (PDD) measurements were performed by irradiating a set of six pieces of EBT3 film (of size 2 cm × 2 cm) keeping at surface and at a depths of 0.5, 1.5, 3.0, 5.0, and 10.0 cm within the slab phantom at 100 cm source-to-surface distance, with no bolus on surface. All film pieces inside the phantom are centered, sandwiched between the plates and taped together to minimize the effect of air gaps in the phantom and were irradiated simultaneously for 200 MU with a field size of 10 cm × 10 cm. Measurements were repeated by placing single, double, and three layers of brass mesh bolus on the surface of phantom. The measured dose readings were normalized to the dose value (also taken as prescription dose) that was obtained from the film irradiated at dmax position, with no bolus. 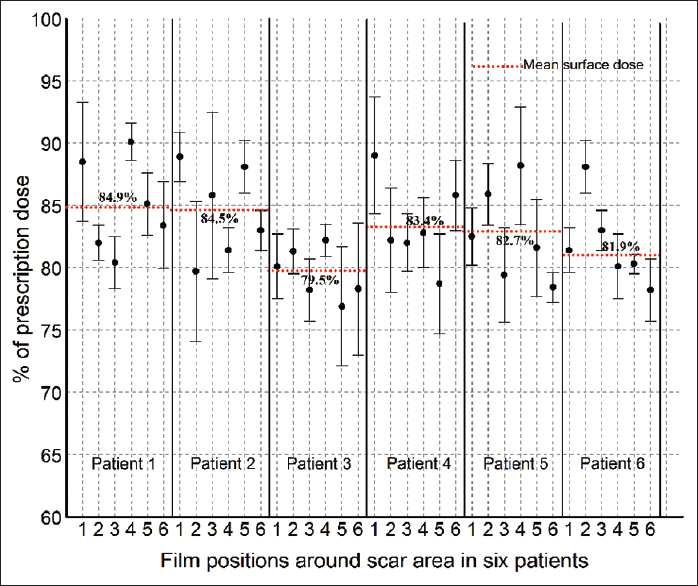 The PDD curves were plotted by taking the normalized dose values versus the depth of film position. 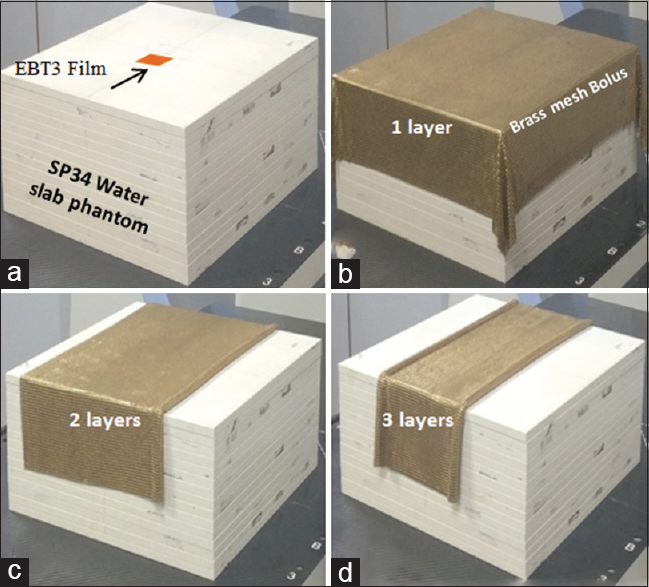 Surface doses were measured from the irradiated films (which were kept on the top of the SP34 phantom surface) to know about the percentage shift of surface dose without and with single, double, and three layers of brass mesh bolus under normal irradiation condition. [Figure 5]a, [Figure 5]b, [Figure 5]c, [Figure 5]d shows the placement of EBT3 film on the top of water slab phantom, under (not shown) single, double, and three layers of brass mesh bolus, respectively. To measure the surface dose on the curved surface area to mimic the clinical conditions, a cylindrical type semi-breast phantom was locally designed and fabricated with plastic bucket (20 cm diameter) with airtight lid. A lung-equivalent insert is simulated by a cork slab (of density ∼ 0.28 g/cm3) having dimensions of 12 cm (length) ×8 cm (height) ×12 cm (width) as shown in [Figure 6]a. 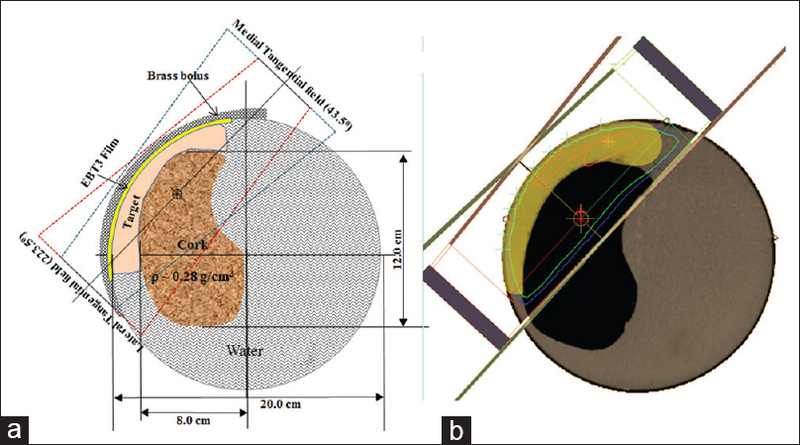 With annular space of 2.0 cm, the cork material is immobilized with the help of wax (density ∼ 1.0 g/cm3) placed in the bottom portion of the bucket [Figure 6]b. The bucket is filled with water, closed with airtight lid, and positioned horizontally on a base [Figure 6]c. This arrangement facilitates experiments with EBT3 film taped on the curved surface. The semi-breast phantom without brass bolus was scanned by computerized tomography (CT) (M/s Wipro GE “High Speed”) unit with 5-mm slice thickness. The CT images were exported to “Focalsim contouring station” (M/s Elekta Ltd., Crawley, UK) through Digital Imaging and Communications in Medicine network. Skin and lung portion along with the postmastectomy chest wall region (as target) were contoured in all slices. They were transferred to CMS XiO® (Elekta Ltd, Crawly, UK) version 4.80.02 treatment planning system (TPS) for dose calculations (with superposition algorithm). Tangential glazing fields were placed at gantry angles of 43.5° and 223.5°, with isocenter at the center of the target and without placement of virtual bolus around the target region. Field-in-field technique with appropriate wedge angle was chosen to avoid the hot spots which were >105% of prescribed dose around the target region. Treatment planning was done without accounting for the brass mesh bolus and by conforming MLC to the target with 6-mm margin. A dose of 200 cGy was normalized to the beams' isocenter. 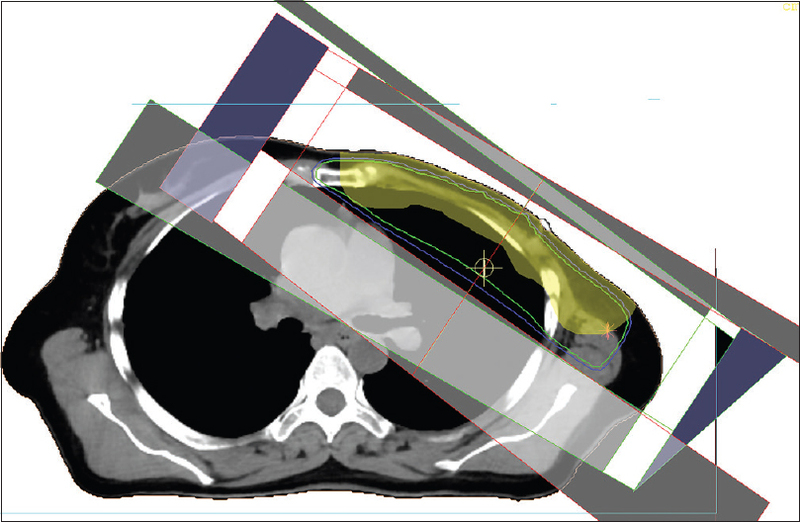 [Figure 7]a shows the schematic diagram of frontal view of semi-breast phantom having lung-equivalent insert with dimensions, target over the curved surface, and brass bolus, and [Figure 7]b shows the representative CT slice of phantom with tangential beams and 95% isodose line (in green color). 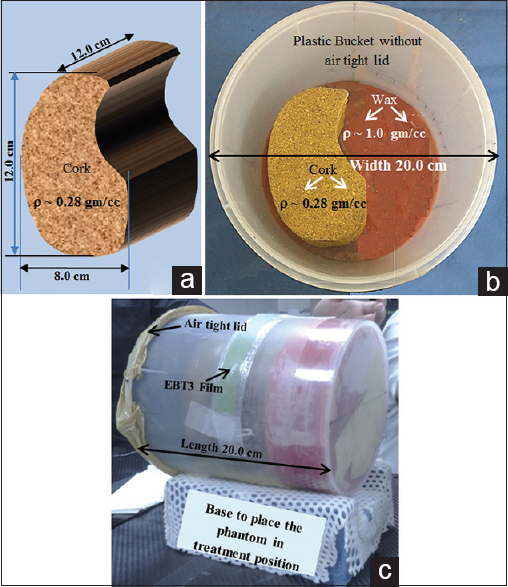 A strip EBT3 film of size 2 cm × 12 cm is taped to the curved surface of semi-breast phantom and also in the region of planned irradiated area of the simulated chest wall region, to measure the surface dose from medial to lateral portion. The treatment plan was delivered with the calculated MUs obtained from TPS for the above tangential plan to all four different configurations: without bolus, with single, double, and three layers of brass mesh bolus. 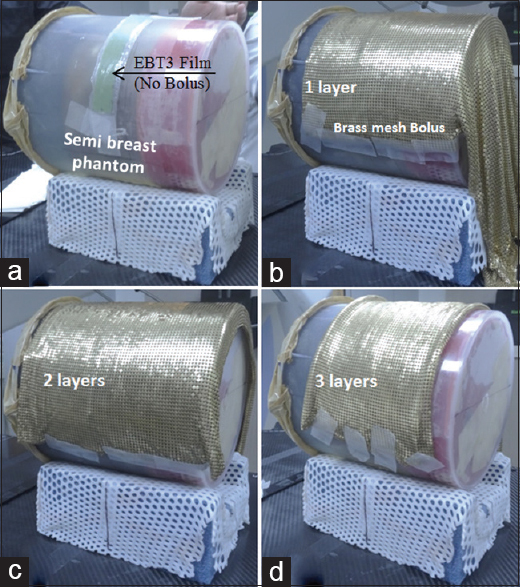 [Figure 8]a, [Figure 8]b, [Figure 8]c, [Figure 8]d shows the EBT3 filmstrip taped to the curved surface of semi-breast phantom without and with single, double, and three layers of brass mesh bolus, respectively, for surface dose measurements. Approval from the Institutional Ethical Committee was obtained for the use of brass bolus for breast treatments. Six patients who underwent mastectomy planned for external beam RT to a prescription dose of 5000 cGy in 25# to the chest wall were considered for surface dose estimates using EBT3 film under cover of single layer of brass mesh bolus. All patients were immobilized in the supine position with a Vac-Loc cushion device and wing board. For RT planning, CT scan images were acquired keeping both arms maximally abducted for optimal exposure of the axilla on the affected side while ensuring the ease of passage for the patient through the CT bore. Anterior view of the left side postmastectomy breast cancer patient having (a) surgical scar, (b) placement of EBT3 film pieces (of size 2 cm × 2 cm) on the surface of skin and around the surgical scar region for skin dose measurements, and (c) single layer brass mesh bolus placed on the top of surgical scar, and EBT3 films are shown in [Figure 9]. The brass bolus is not placed during CT simulation process to prevent artifacts related to imaging which may come in the way of dose calculation. Scanned serial CT images were transferred to Monaco (M/s Elekta Ltd, Crawly, UK, Version 5.11.02) contouring station, and target volumes as appropriate were contoured using the Radiotherapy Oncology Group guidelines for radiotherapeutic treatment of postmastectomy breast cancer patients. Organs at risk contoured include bilateral lungs, spinal cord, and heart. [Figure 10] shows the central CT slice of tangential treatment plan of a left side chest wall patient with 95% isodose coverage. Before the start of treatment, EBT3 films pieces were placed around the scar region and under single layer brass mesh bolus which was overlaid (without having any wrinkles) on the patient's chest wall, and treatment was delivered with calculated MUs by TPS. Multiple layers of brass bolus were not used clinically due to the shearing movements and handling problems. All patients were reviewed weekly during the course of treatment for documentation of skin toxicity as per the NCIS criteria and also to take the decision of continuation of treatments with bolus by the treating clinician. The application of bolus was discontinued once Grade 2 skin toxicity was observed. Dose received by film pieces in respective positions were noted, and measurements with bolus were repeated for at least three times in all six patients. In one patient, after discontinuation of bolus application, measurements were taken three times to calculate the total dose delivered to the chest wall during the course of entire treatment. Clinical application of brass bolus and skin toxicity of a PMRT patient undergoing left side chest wall treatment is shown in [Figure 11] with (a) film placement positions (6 Nos) around the postoperative scar region, (b) placement of single layer of brass bolus on the chest, and (c) Grade 2 skin toxicity observed by the clinician at 21st fraction of treatment. The measured surface doses (obtained from phantom and patients) were expressed as percentage of prescribed dose with one standard deviation (1SD). 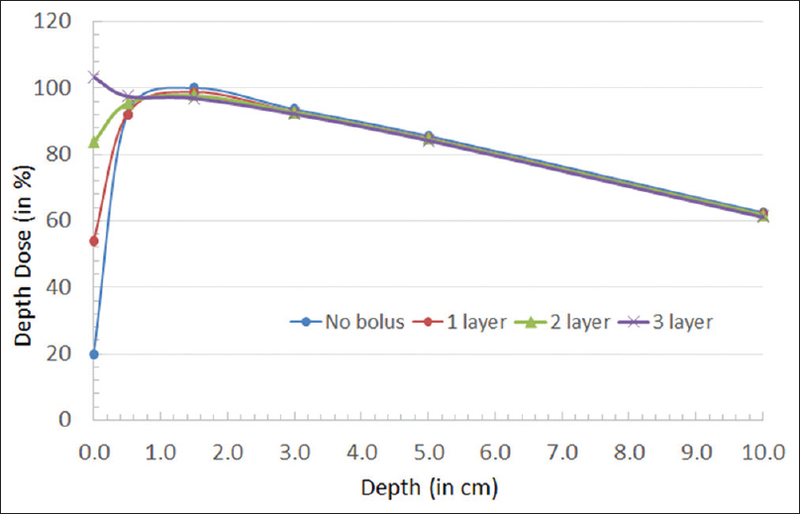 Measured water-equivalent thickness of brass mesh bolus (by keeping multiple layers) is shown in [Table 1]. The water-equivalent thickness per layer of brass bolus (mean ± SD) was obtained as 2.09 ± 0.13 mm which is in agreement with the value quoted in the literature. [Figure 12] shows the PDD curves for normally incident 6 MV photon beam for 10 cm × 10 cm field for the case of no bolus, single, double, and three layers of brass mesh bolus obtained with EBT3 film in SP34 phantom. The mean percentage dose difference at 3.0, 5.0, and 10.0 cm depths with single, double, and three layers of brass mesh bolus against no bolus was −1.1% ± 0.4%, −1.0% ± 0.3%, and −1.4% ± 0.7%, respectively. Dose measurements at dmax in SP34 phantom were found to be within 1.2% ±0.3% without and with successive layers of the mesh. Doses below dmax remained unaffected by placement of single layer of the bolus. From these measurements, it is observed that the doses at depths down to 10 cm varied by <1.5%. In the above circumstances, delivery of the same MUs with the brass mesh (calculated by TPS without it) does not alter the dose delivered significantly. The values observed in this study are in agreement with the ones published in the literature. Measured surface doses (expressed as percentage of prescribed dose) with EBT3 film in vertical beam incidence (in SP34 phantom) compared with angulated beam incidence (in semi-breast phantom) are shown [Table 2]. The surface doses showed steady increase with more layers, in both geometries. For solid water-equivalent phantom, the surface dose increased from 25.2% ± 0.9% without bolus to 62.5% ± 3.1%, 80.1% ± 1.5%, and 104.4% ± 1.7% with single, double, and three layers of brass bolus, respectively. For prototype semi-breast phantom, surface dose of 32.6% ± 5.3% without bolus increased to 96.7% ± 9.1%, 107.3% ± 9.0%, and 110.2% ± 8.7% under similar circumstances. The effect of single layer of brass bolus on the surface dose in the clinical setting of six patients is shown in [Figure 13]. 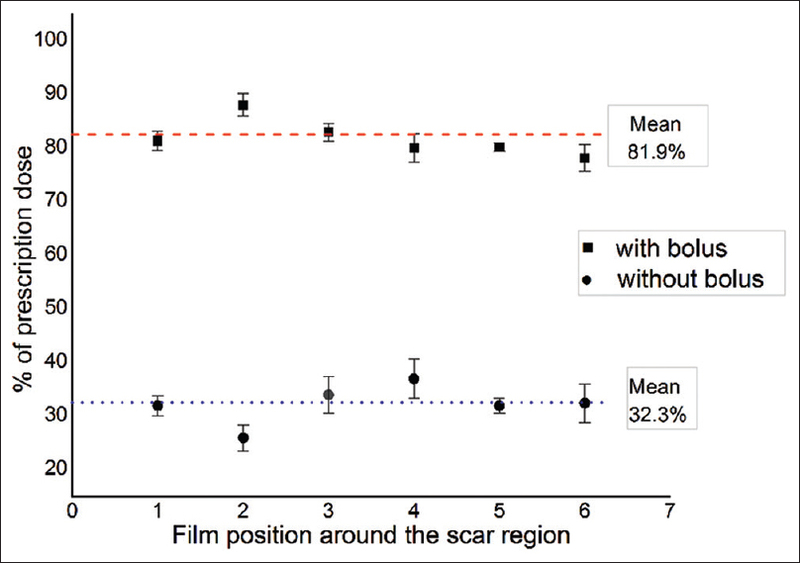 The mean surface dose (expressed as percentage of prescribed dose) with 1SD around the scar region with single layer of brass observed was 84.9% ± 3.8%, 84.5% ± 3.7%, 79.5% ± 2.0%, 83.4% ± 3.5%, 82.7% ± 3.8%, and 81.9% ± 3.4% in all six patients, respectively. The number of fractions for the development of Grade 2 skin toxicity and subsequent brass bolus removal ranged between 18 and 23 among these patients. The mean surface dose with and without brass bolus of the sixth patient was 81.9% versus 32.4%, respectively, which is as shown in [Figure 14]. This patient developed Grade 2 skin toxicity at 21st fraction of treatment, and the use of bolus was discontinued thereafter. This observation was in agreement with the result obtained from prototype semi-breast phantom study. Therefore, the total skin dose to the chest wall for this patient was calculated as ([200 × 0.819 × 21] + [200 × 0.323 × 4] =3439.8 + 259.2 = 3699 cGy) from the overall treatment with and without bolus application. The present report brought out the various dosimetric measurements for implementation of brass mesh bolus for tangential chest wall radiotherapy for postmastectomy patients. The atomic number Zeff = 29.3 for brass and its physical density P∼8.5 g/cm3 perturbs the buildup characteristics by increased absorption of 6 MV photons showing enhancement of surface doses. The surface dose shift translates to a smaller thickness of brass mesh, compared to water-equivalent commercial bolus materials available. 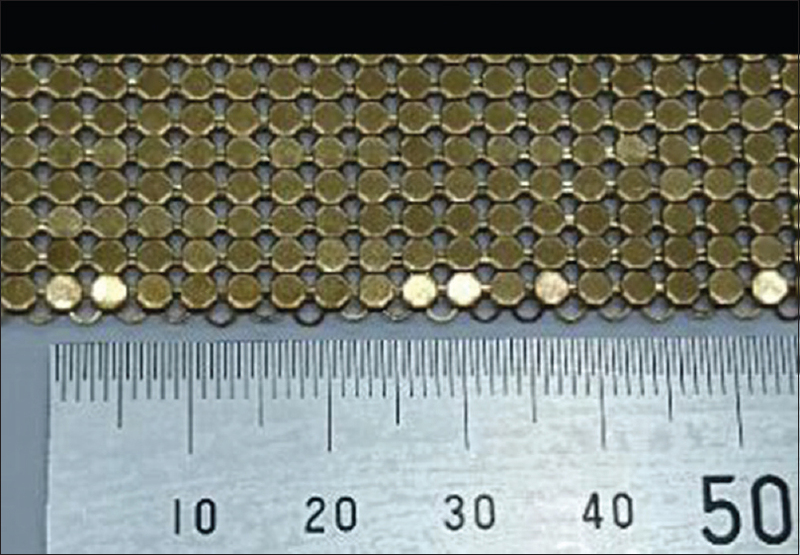 Our results brought out enhancement of surface dose by a single layer of 1.2 mm of brass mesh from 25.2% to 62.5% (by a factor of about 2.5 times) due to the density increase by 8.5 times of brass against water. After buildup, the quality of the photon beam has not significantly changed, which is apparent from our results on PDD not significantly varying beyond the dmax(dose at depths varying <1.1%). This dual effect of brass mesh bolus is clinically beneficial as it conforms to surface irregularities easily reducing air gaps. Our separate studies (not reported here) also showed that air gaps reduce surface doses, which are commonly encountered with gel bolus materials bringing an edge to brass bolus. Considering this, brass mesh may be used as a substitute for TEB to increase superficial dose for chest wall radiotherapy treated with tangent plans. One study by Ordonez-Sanz et al. compared the surface dose using 3-mm Superflab™, 5-mm Superflab™, brass mesh, and a half-time 1 cm Vaseline® bolus using thermoluminescent dosimeters (TLD) in a phantom. For a 6 MV plan, the average skin dose as measured by a TLD was 68% of the prescription dose for no bolus, 100.7% for Vaseline®, 97.7% for 3-mm Superflab™, and 91.6% for brass mesh. They concluded that the single layer brass bolus was ideal as it required only one treatment plan, did not require modeling in the TPS, resulted in superior conformity to the skin surface, and did not result in as high a skin dose as the 3-mm Superflab™. However, skin toxicity was not reported because their experiments were performed with a phantom. Lauren et al. conducted a prospective study to measure chest wall doses using optically stimulated luminescence dosimeters in 49 patients, who received radiation with a daily 2-mm Superflab™ gel bolus and monitored weekly for skin toxicity as per the National Cancer Institute Common Toxicity Criteria. The mean chest wall dose ranges from 98.1% to 108.1% of the prescription dose with the majority (71.4%) of patients developing Grade 2 skin toxicity. They demonstrated that a daily 2-mm Superflab™ bolus is a feasible regimen for chest wall in women undergoing PMRT without reconstruction or a tissue expander in place which also allows for adequate dose buildup with acceptable acute skin toxicity and eliminates the errors associated with creating and using multiple treatment plans and every-other-day bolus use. However, this report addresses the continuation of 2-mm Superflab™ gel bolus till the end of treatment regimen with the maximum dose of 60.4 Gy. Our study entailed removal of brass bolus immediately after Grade 2 acute skin toxicity. Ward et al. conducted a study about the efficacy of bolus in chest wall radiotherapy with conventional Vaseline (50% of fractions) versus brass bolus (80% of fractions) in a group of 15 patients each. All patients were reviewed on a weekly basis during radiotherapy, and mean acute toxicity (pain, dermatitis, and itch) was assessed and compared using European Organization for Research and Treatment of Cancer grading. Using 50 Gy in 25 fraction treatment schedule, a mean dermatitis score of two is observed in both groups with no excess toxicity in domains of pain or itch. The brass mesh demonstrates the necessary properties to modify the dose to target volume without altering the depth dose which makes for an ideal choice of bolus material for a single plan solution. Assessment of patients treated with both the conventional and the brass mesh bolus demonstrated no additional acute toxicity. The outcome of our study is similar in its manifestation of acute Grade 2 skin toxicity between 18th and 23rd fractions of 50 Gy in 25 fractionation schedule. Healy et al. described in vivo surface dose measurements in 16 female patients who received PMRT with brass mesh bolus of single layer to the chest wall. Therein, it was demonstrated that the surface doses ranged from 81% to 122% of the prescribed dose. They estimated skin doses in opposed tangential 6 MV photons with TLD and metal-oxide-semiconductor field-effect transistor detectors. In our study, the mean surface doses ranged between 79.5% and 84.9% of prescribed dose during bolus use. This difference may be attributed to the surface contours of the locations at which the measurements were taken. However, in our study, we have also calculated and reported the total surface dose (with and without brass bolus) to the chest wall in a representative patient. Another study highlighted the effect on depth dose, surface doses in tangential beams, and the safety implications in PMRT with brass bolus. The surface dose around the curved area under single layer of brass bolus with radiochromic EBT3 film was recorded and ranged from 40% to 72% with no bolus which increased to 75%–110% of prescription dose with bolus. Our dose estimates show similar magnitude of surface doses. Using our phantom results, we could get institutional ethical committee clearance for the clinical implementation of brass mesh bolus. Its efficacy was demonstrated in clinical use as shown by the surface dose measurements in [Figure 13] and [Figure 14]. After accruing more patients, we plan to report the clinical results separately. Authors thank administration of Kasturba Medical College Hospital, Attavar, Mangalore, for the kind permission to communicate our results. The above work forms part of research study on clinical implementation of brass bolus for treatment of patients with the Institutional Ethical Committee approval No. IEC KMC MLR 09–17/154 dated September 20, 2017. The source of funding for purchase of brass bolus on research grants of the department has been acknowledged. Gaudette LA, Gao RN, Spence A, Shi F, Johansen H, Olivotto IA, et al. Declining use of mastectomy for invasive breast cancer in Canada, 1981-2000. Can J Public Health 2004;95:336-40. Lazovich D, Solomon CC, Thomas DB, Moe RE, White E. Breast conservation therapy in the United States following the 1990 national institutes of health consensus development conference on the treatment of patients with early stage invasive breast carcinoma. Cancer 1999;86:628-37. Healy E, Anderson S, Cui J, Beckett L, Chen AM, Perks J, et al. Skin dose effects of postmastectomy chest wall radiation therapy using brass mesh as an alternative to tissue equivalent bolus. Pract Radiat Oncol 2013;3:e45-53. Andry G, Suciu S, Vico P, Faverly D, Andry-t'Hooft M, Verhest A, et al. Locoregional recurrences after 649 modified radical mastectomies: Incidence and significance. Eur J Surg Oncol 1989;15:476-85. Hsu SH, Roberson PL, Chen Y, Marsh RB, Pierce LJ, Moran JM. Assessment of skin dose for breast chest wall radiotherapy as a function of bolus material. Phys Med Biol 2008;53:2593-606. Andic F, Ors Y, Davutoglu R, Baz Cifci S, Ispir EB, Erturk ME, et al. Evaluation of skin dose associated with different frequencies of bolus applications in post-mastectomy three-dimensional conformal radiotherapy. J Exp Clin Cancer Res 2009;28:41. Jin-Beom C, Jae-Sung K, In-Ah K. Surface dose measurements from air gaps under a bolus by using a MOSFET dosimeter in clinical oblique photon beams. J Korean Phys Soc 2012;61:1143-7. Vu TT, Pignol JP, Rakovitch E, Spayne J, Paszat L. Variability in radiation oncologists' opinion on the indication of a bolus in post-mastectomy radiotherapy: An international survey. Clin Oncol (R Coll Radiol) 2007;19:115-9. Mayadev J, Einck J, Elson S, Rugo H, Hwang S, Bold R, et al. Practice patterns in the delivery of radiation therapy after mastectomy among the university of California Athena breast health network. Clin Breast Cancer 2015;15:43-7. Blitzblau RC, Horton JK. Treatment planning technique in patients receiving postmastectomy radiation therapy. Pract Radiat Oncol 2013;3:241-8. Fessenden P, Palos BB, Karzmark CJ. Dosimetry for tangential chest wall irradiation. Radiology 1978;128:485-9. Anderson PR, Hanlon AL, Fowble BL, McNeeley SW, Freedman GM. Low complication rates are achievable after postmastectomy breast reconstruction and radiation therapy. Int J Radiat Oncol Biol Phys 2004;59:1080-7. Ordonez-Sanz C, Bowles S, Hirst A, MacDougall ND. A single plan solution to chest wall radiotherapy with bolus? Br J Radiol 2014;87:20140035. Manger R, Paxton A, Cerviño L. Dosimetric assessments of brass mesh bolus for post mastectomy photon radiotherapy. J Appl Clin Med Phys 2016;17:86-96. Nakano M, Hill RF, Whitaker M, Kim JH, Kuncic Z. A study of surface dosimetry for breast cancer radiotherapy treatments using gafchromic EBT2 film. J Appl Clin Med Phys 2012;13:3727. Casanova Borca V, Pasquino M, Russo G, Grosso P, Cante D, Sciacero P, et al. Dosimetric characterization and use of GAFCHROMIC EBT3 film for IMRT dose verification. J Appl Clin Med Phys 2013;14:4111. Moylan R, Aland T, Kairn T. Dosimetric accuracy of gafchromic EBT2 and EBT3 film for in vivo dosimetry. Australas Phys Eng Sci Med 2013;36:331-7. Balter S, Hopewell JW, Miller DL, Wagner LK, Zelefsky MJ. Fluoroscopically guided interventional procedures: A review of radiation effects on patients' skin and hair. Radiology 2010;254:326-41. Thoms WW Jr., McNeese MD, Fletcher GH, Buzdar AU, Singletary SE, Oswald MJ. Multimodal treatment for inflammatory breast cancer. Int J Radiat Oncol Biol Phys 1989;17:739-45. IAEA. Absorbed Dose Determination in External Beam Radiotherapy. Technical Report Series TRS 398. Vienna: International Atomic Energy Agency; 2000. Das LC, Golden DW, Perevalova E, Wong AC, De Nardo K, Stepaniak C, et al. A feasibility study of 2-mm bolus for postmastectomy radiation therapy. Pract Radiat Oncol 2017;7:161-6. Ward A, Wolstenholme V, Prentice M. Brass mesh bolus versus conventional vaseline bolus for chest wall radiotherapy. Single plan solution? Clin Oncol 2015;27:e9-14.